Atlas is competing in its 49th season of soccer since being formed in the Summer of 1997. 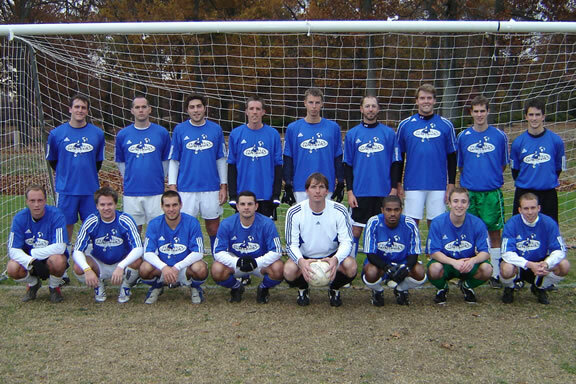 We currently compete in the 1st Division of the Central Virginia Soccer Association (CVSA,) an adult soccer league based in Richmond, VA.
Also, Atlas Soccer Club has several other teams. This Fall, our clubmates, Titans, will be in the 6th Division along with Lightning (A.C. Thunder) and Lady Titans in the Women's Division and Titans Coed, in the Coed Recreational Division. For more information on Titans or A.C. Thunder teams go to their respective websites. More than 250 different players have taken the pitch for Atlas since '97. The average current Atlas player is 27 years old and has played in about 120 games with the club. We are always looking to improve, so if you're interested in joining, send us a message at ATLAS and please include your name, e-mail, phone number, age, position, and experience. Atlas wears the Adidas Squadra jersey in royal blue or white Nike jerseys with white or royal shorts and socks. Atlas Coed wears the Adidas Sereno jersey in royal blue or white Nike jerseys with white or black shorts and socks.